Muralist, illustrator, comics artist, poster designer—William Stout has created a body of work that transcends genre, medium, and industry during his astonishing forty-year career. He has designed album covers for the Who and the Rolling Stones, worked on films ranging from Ralph Bakshi’s Wizards to Guillermo del Toro’s Pan’s Labyrinth, and brought the world of the dinosaurs to life through highly acclaimed paleoart. Now Stout fans can relive the life and career of their favorite artist with this breathtaking monograph. Curated by the artist himself, Fantastic Worlds: The Art of William Stout bursts with the most iconic imagery in Stout’s oeuvre. From his student years to his robust career as a painter, illustrator, and more, Fantastic Worlds gives readers an in-depth understanding of how Stout developed as an artist, illustrated by his most inspired work. 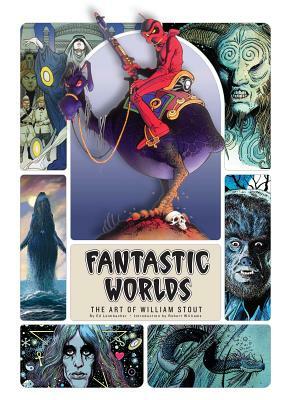 Visually stunning and definitive, Fantastic Worlds is the ultimate Stout retrospective—the perfect way for fans to commemorate the extraordinary work of a one-of-a-kind artist. "There is more than art here to please the pop culture fan...Throughout the book is the interesting story of Stout's life and career, with lots of fascinating facts that give individual pieces a backstory of their own." "Bill Stout is one of the most prolific and truly under appreciated artists of our time. Every page of Fantastic Worlds reminds you that he had a hand in shaping the look of the last four decades of film across just about every genre imaginable. Without knowing it, we’ve been surrounded by his work and now we get to do a deep dive into his world and I couldn’t be more excited." "The book is absolutely beautiful. I highly recommend you picking up a copy if you are a fan of William Stout's artwork!" "The Art of William Stout. Legendary!"